Author, President, Nelson Motivation Inc.
Companies spend around $90 billion dollars annually on non-cash incentive programs. Yet, even among the most admired companies, satisfaction with recognition is almost always among the lowest rated items on employee opinion surveys. With so much investment, why is there so little return? Poorly designed recognition and incentive programs are, at best, ineffective, and at worst, de-motivating. Well-intentioned HR professionals often design recognition and incentive programs that they personally find motivating, without necessarily considering the feelings or preferences of those on the receiving end. There is often a slanted focus toward tangible rewards without considering the potential of non-tangible rewards. 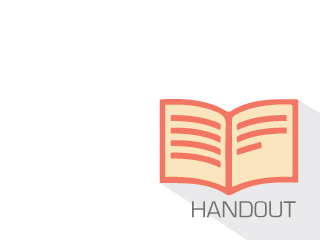 Segmentation research is an effective tool for designing employee reward and recognition systems in the same way that customer segmentation is an effective way of marketing products and services. 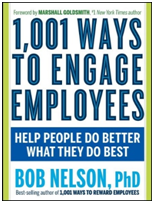 Bob Nelson, Ph.D., is considered the world’s leading authority on recognizing, rewarding and engaging employees. He has worked with 80 percent of the Fortune 500 companies and presented on six continents to help improve strategies, systems and programs for better motivating employees to achieve exceptional performance. 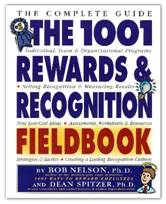 Dr. Nelson has sold over 5 million books on management and employee motivation, which have been translated into 37 languages, including 1501 Ways to Reward Employees, The Recognition & Rewards Fieldbook, The Management Bible, 1001 Ways to Energize Employees, Ubuntu! 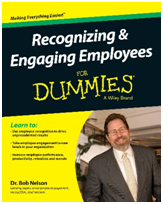 Inspiring Teamwork & Collaboration at Work, Recognizing & Engaging Employees For Dummies, and his most recent book, 1001 Ways to Engage Employees. He has appeared extensively in the national and international media including CBS 60 Minutes, CNN, CNBC, MSNBC, PBS, and National Public Radio; and is a frequent expert resource for The New York Times, The Wall Street Journal, The Washington Post, BusinessWeek, Fortune, and Inc. magazines. Bob is president of Nelson Motivation Inc. (www.drbobnelson.com), a management training and consulting company located in San Diego, California and can be reached at bob@drbobnelson.com. Dr. Rick Garlick recently joined Magid Associates as Vice President, Strategy Consultant. During a career that has spanned over two decades, Rick has worked with some of the most prestigious companies in the world, in a variety of research and consulting roles. He has a diverse research and consulting background that includes extensive experience with customer experience management, employee engagement measurement and training; talent selection; brand research; customer loyalty programs; image and awareness studies; and national opinion polling. Rick is a former Global Practice Lead at J.D. Power where he provided industry thought leadership to the company’s clients in the hotel, rental car, airline, destination, gaming, and cruise line industries. His resume’ also includes experience with two of the most prestigious research companies in North America: The Gallup Organization and Maritz Research where he worked extensively in media and entertainment, financial services, utilities, manufacturing, retail, association, and not-for-profit research. Prior to entering the private sector, he taught courses in research methods, marketing, and persuasive communication at Michigan State University and DePaul University in Chicago. A frequent conference speaker, Dr. Garlick has published numerous articles in industry and academic journals. He has also appeared on such national media outlets as MSNBC, CNBC, CNNfn, Bloomberg Television, and National Public Radio, as well as being quoted in a number of national publications. Dr. Garlick has served as chair of the Research Committee for the Hospitality Sales and Marketing Association (HSMAI) Foundation Board and Meeting Professionals International (MPI). Dr. Garlick received a Ph.D. in communication studies from Michigan State University.